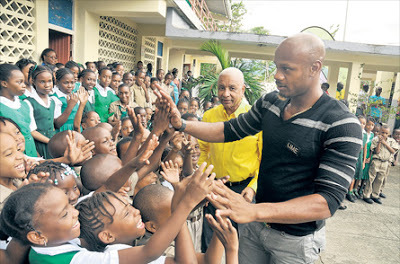 ASAFA POWELL DONATES TO HIS ALMA MATER. For Asafa Powell, it’s always the season of giving. The former 100 M world-record holder last Thursday made a generous donation of $150,000 to his St. Catherine-based alma mater Ewarton Primary in aid of the institution’s planned upgrading of their PE department. Powell’s sponsors LIME donated a brand-new desktop computer to the school. Two Fridays ago, Powell was on location at the Jamaican-German Automotive School in Kingston to hand over a cheque of $250,000 to assist several Level-3 students. 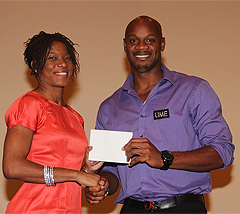 Cydonie Mothersill was grateful to Asafa Powell for attending. Few athletes in the world have the connections to get world record holders and Olympic champions to attend a low-key fundraising event at a moment’s notice, yet that is exactly what Cydonie Mothersill managed to do for her celebrity lunch on Saturday. Cayman’s celebrated sprinter hosted Dine With the Olympians lunch at the Grand Cayman Marriott Beach Resort and none other than former 100 metres world record holder Asafa Powell hopped over from Jamaica at short notice as one of the star guests. 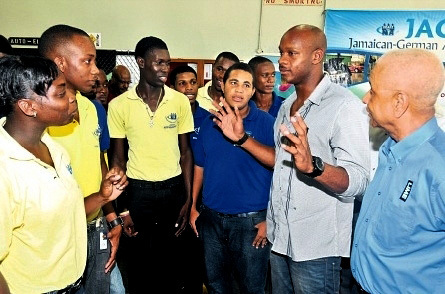 London 2012 Olympic Games 100m finalist Asafa Powell (second right) and Lime Foundation Chairman Errol K Miller (right) speak to students at the Jamaican-German Automotive School Academy (JAGAS) on Maxfield Avenue yesterday. Powell donated $200,000 of his award from the Jamaican Government for making the men’s 100m final at the Games to the school yesterday. Powell will donate the remaining sum to his alma mater Ewarton Primary School.